Choose a wide strip of ribbon to set the theme for a ribbon decorated pumpkin, then accessorize with autumn leaves and seasonal accents. This project is so simple and satisfying to make; you can use whatever autumn floral picks that you have around, or collect some real Fall leaves in full color to add to this centerpiece or mantle decoration. I have set my ribbon decorated pumpkin, and all the embellishments, on a tray so that I can set it out on my porch coffee table for fine days and bring it in if the weather is too wet or windy. Run a damp cloth over the pumpkin to remove any dust and dirt, then buff with a dry cloth to bring out the natural shine. Wrap a length of wide ribbon around the pumpkin to establish the length that you need, allowing a two inch overlap. Cut the ribbon at this point and secure it around the pumpkin with two safety pins, ensuring that the ribbon fits snugly all around. 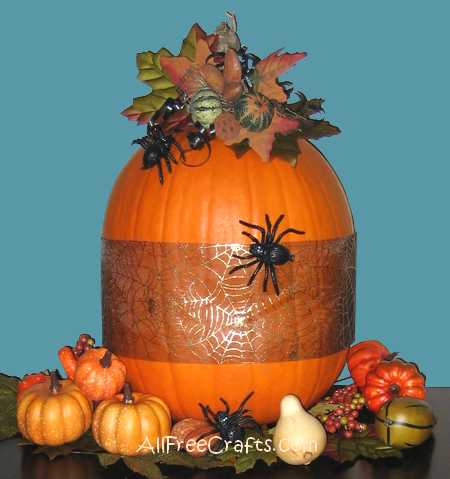 Set the pumpkin on a tray and surround the base with autumn leaves. Set miniature pumpkins, gourds and nuts on the leaves, all around the pumpkin. Fasten a pick of autumn leaves and miniature gourds to the pumpkin stem. If the pick has a long enough wire, you may be able to do this by winding the wire around the stem. If not, tie in place with a little curling ribbon. Tie two long lengths of black curling ribbon to the stem and use the blunt side of a knife to curl each length. Finally, attach three spiders or bats – one near the stem, another on the ribbon, and the third near the base. I used standard sewing pins to stick the spiders to the pumpkin but you could also use double-sided tape or a little hot glue.